Guided by a dangerous and unlikely mentor, Rio formulates a plan that leads to increasingly treacherous questions about her mother's death, her own destiny, and the complex system constructed to govern the divide between land and sea. Her life and her city depend on Rio to listen to the voices of the past and to speak long-hidden truths. Do you remember when books were one and done? When there were no sequels...or prequels...or novellas and companions. On occasion it still happens, and Condie does an amazing job introducing a new world, a new hero, and seeing her through to the end in only 368 pages. 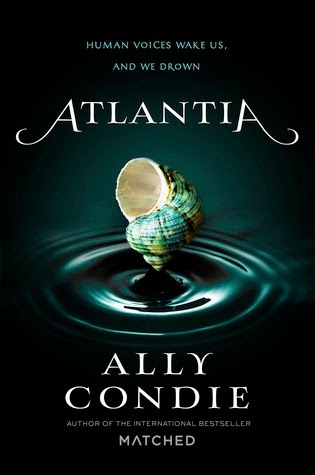 The Little Mermaid meets City of Embers in the latest novel by Ally Condie. Rio dreams of going above, from escaping the city of Atlantia below the sea and walking on land under real trees and stars. But only one member of a family may make the sacrifice to travel above, and when Rio's twin sister Bay unexpectedly makes the decision to leave, Rio is devastated. She will stop at nothing to find a way to the land above, and as her world continues to crumble she discovers that the utopian life of Atlantia isn't quite as utopian as she was led to believe. Condie does a pretty impressive job of creating an entire world, a heroic protagonist, tons of intrigue, and a sweet love story (between sisters and a friend), in one short novel. Rio is a siren. With one word she can bend anyone to her will, but her mother has taught her to be silent, and through integrity and love, she has learned that everyone deserves the right to choose. But the story did remind me of other stories. Rio could be Lina in Ember, a dying city with a corrupt government. Or she could be Ariel, a princess under the sea who dreams of a life above. It was still an excellent story. There was a sweet love story that seemed genuine and not full of teenage lust. There was the struggle to be kind and moral instead of the easy way out. There's mystery and sadness, and fun. This was fun. And the audiobook was fantastic. So if you have the time, give it a listen! maybe I should have listened to this one. I read it and my favorite part was that it was a stand alone book. I finished it feeling, eh.